Along the Bridle Path where I have been doing a lot of digiscoping and general photography this summer, there are hundreds of these Wood Nymphs. I have never seen so many. 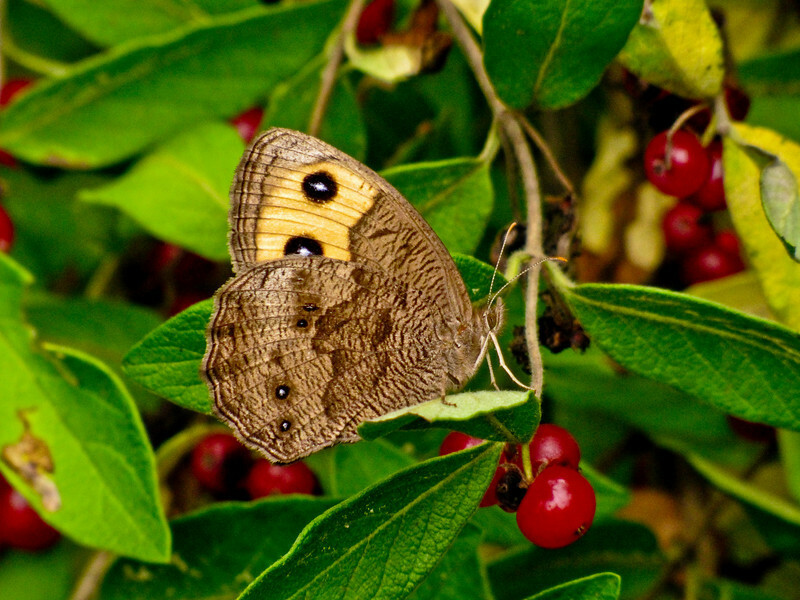 In fact, until a month ago I am pretty sure I had never seen any…I had to look my first one up in the New England Nature Guide on my iPhone…though it must be a common butterfly in Southern Maine. Just not looking I guess. They rarely sit still long enough for a good portrait. Canon SX20IS at full zoom and macro, 560mm equivalent field of view. F5.7 @ 1/320th @ ISO 400. Programmed auto. A touch of Fill Light in Lightroom, Blackpoint right, added Clarity and Vibrance, Sharpen narrow edges preset. As far as the shot itself goes…well it has just about everything going for it. Glorious sky, reflections in still water, strong horizon with the mass of houses leading in on the left, wonderful detail and interesting texture in the swirling marsh grasses, subtle effective color tones throughout…even that bit of stump sticking up to anchor the eye in the foreground. Add the HDR effect and you get a photograph that strikes the eye like the best landscape painting…in the sense that we are not used to seeing this kind of range in a photograph. It almost makes me laugh out loud when I remember that it was produced completely on the iPhone 4! Who could have imagined it? From iPhone 4 HDR and Panos. 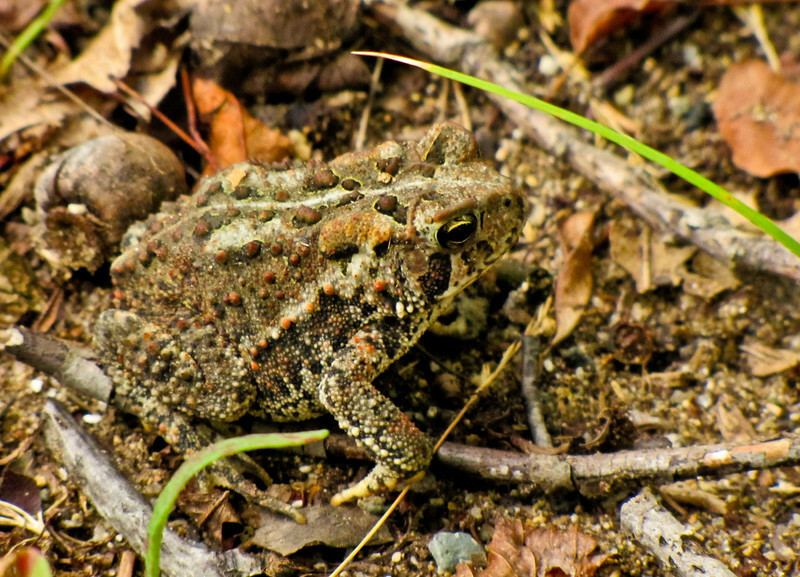 Eastern American Toad. This is why you always carry a second camera when digiscoping. You just never know what is going to hop across your path. Literally in this case…both the hop and the path part. 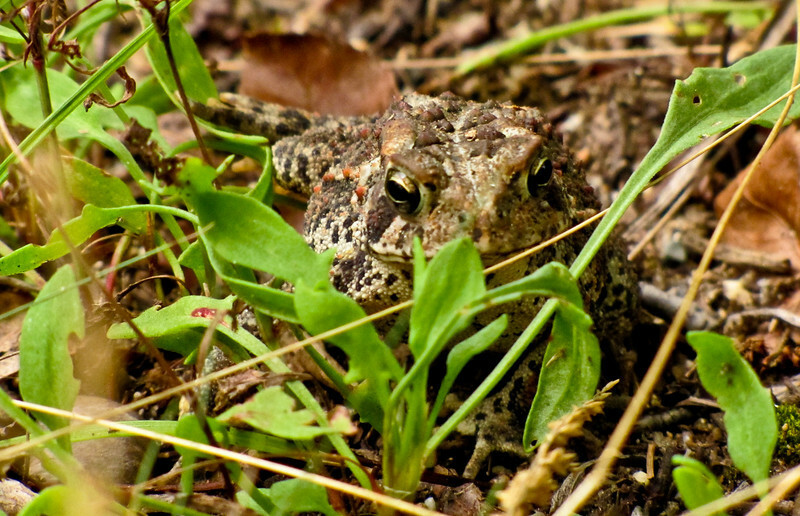 He came to rest first under a clump of grasses beside the Kennebunk Bridle Path, which made getting an angle more than difficult, but then hopped out in the open before I had finished with him. Not that he is much more visible out in the open than under the grasses. Such a handsome creature! Canon SX20IS at full zoom, 560mm equivalent, and Macro. F5.7 @ 1/320th and 1/250th @ ISO 400. Programmed auto. For the top shot, I had to use the flip out LCD on the Canon to get the angle, and then, finding the toad on that LCD at full zoom was a real challenge! A touch of Fill Light and Blackpoint right in Lightroom. Added Clarity and just a bit of Vibrance. Sharpen narrow edges preset. Both images cropped slightly for composition. Continuing one more day with the iPhone theme, here is an AutoStitch panorama made up of 10 separate images…5 across, and two down. It needs to be viewed as large as your monitor will take it. Click the image and use the size controls a the top of the window that opens. AutoStich could not be easier to use. Take any number of overlapping images with the iPhone’s camera so they are saved to the Camera Roll. Then open AutoStich and select them from within the app. That’s it. AutoStitch then intelligently assembles the images into a panorama, blends exposure, renders the finished image and gives you the option to auto crop. The image is not perfect…but it is very close. Since I often, as in this shot, have to straighten the horizon a bit, and I want to sharpen slightly and maybe adjust curves, I generally do the cropping in PhotoGene, again, right on the iPhone. Finally, I upload the image to my Wide Eyed In Wonder site directly from the phone using SmugShot. Could not be easier. 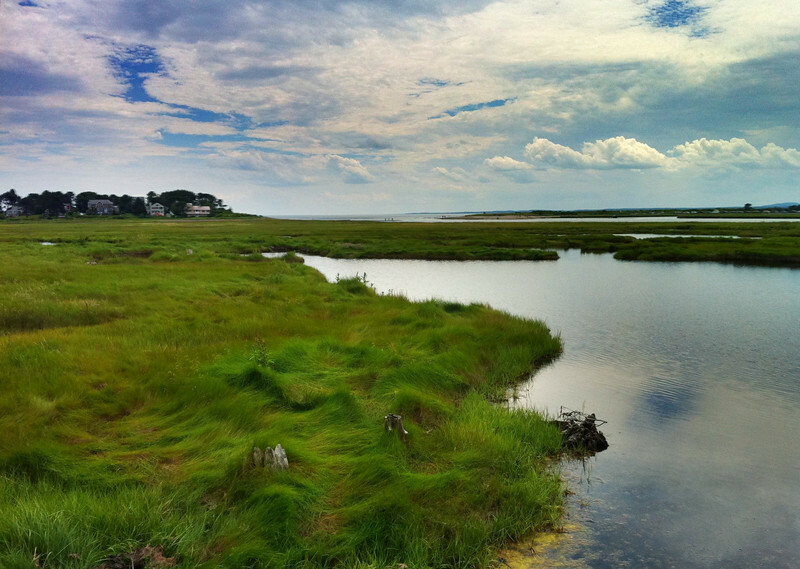 This, by the way, is the mouth of the Mousam River, seen from the Kennebunk Bridle Trail across the marsh…Great Head, Parson’s Beach, and almost out to Route 9 on the right…close to 180 degrees. Taken and processed with the iPhone 4. From iPhone HDR and Pano. The camera on the new iPhone 4 is the first decent camera on a cell phone I have used…and it is pretty good. Auto Focus, Selective focus (tap to select focus point), Selective metering (tap), 5mp back-illuminated sensor for fairly high sensitivity and low noise. All and all, by the specs, pretty good. However, it is the apps that really make the camera sing, and that actually tempt me to use it even when I am carrying my real camera! Take Pro HDR for instance. Open the app. Tap once on a light portion of the scene. Take a shot. Tap again on a dark portion of the scene. Take a shot. The app then combines the two shots into a true HDR rendering of the view. It even provides sliders to fine-tune Contrast, Saturation, and Color Temperature. The results, right out of the app, can be impressive. Both of the shots here were then opened in PhotoGene on the iPhone for straightening, sharpening, and some levels and color adjustment before being directly uploaded to my Wide Eyed In Wonder SmugMug site from the phone (using SmugShot, a free app from SmugMug). I certainly wish my real camera could do all of those things! The iPhone does not record much in the way of EXIF data so all I can say is taken with the iPhone 4. From iPhone 4 HDR and Pano. 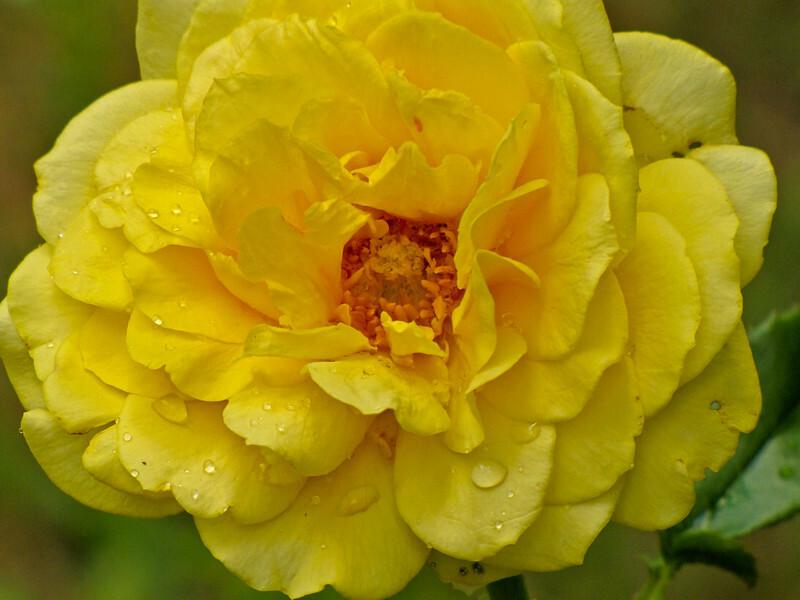 We only have very few roses in our yard…they don’t do as well as Daylilies…but we enjoy the ones we have. This bright yellow was in full bloom and I caught it right after an afternoon shower with the beads of rain still on the petals. This is another example of what I love about the Canon’s telephoto macro. Canon SX20IS at full 560mm equivalent and macro, f5.7 @ 1/400th @ ISO 100. Aperture preferred. Some Recovery in Lightroom. A small amount of Fill Light and Blackpoint right. Added Clarity and just a bit of Vibrance. Sharpen narrow edges preset. 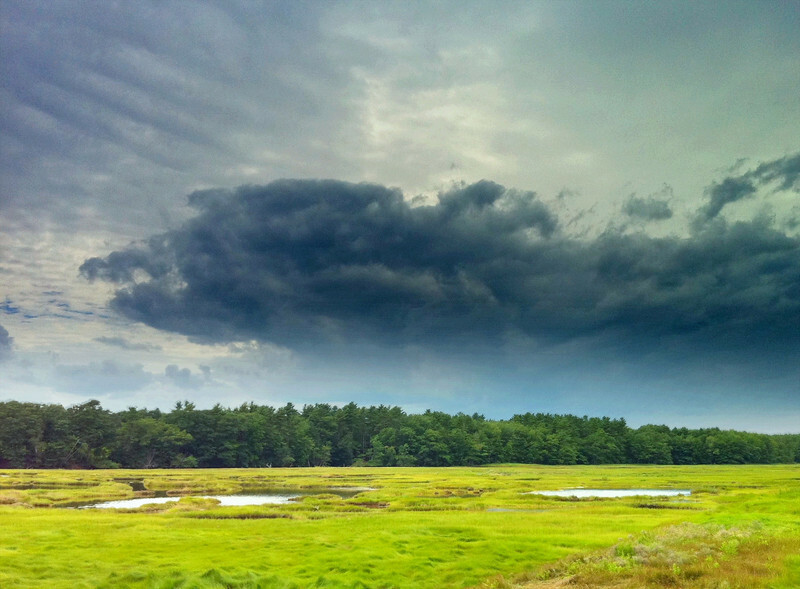 From The Yard, Kennebunk ME. With a 6:46 am flight out of John Wayne International in Santa Ana CA, I was up early and outside the hotel waiting for my taxi. 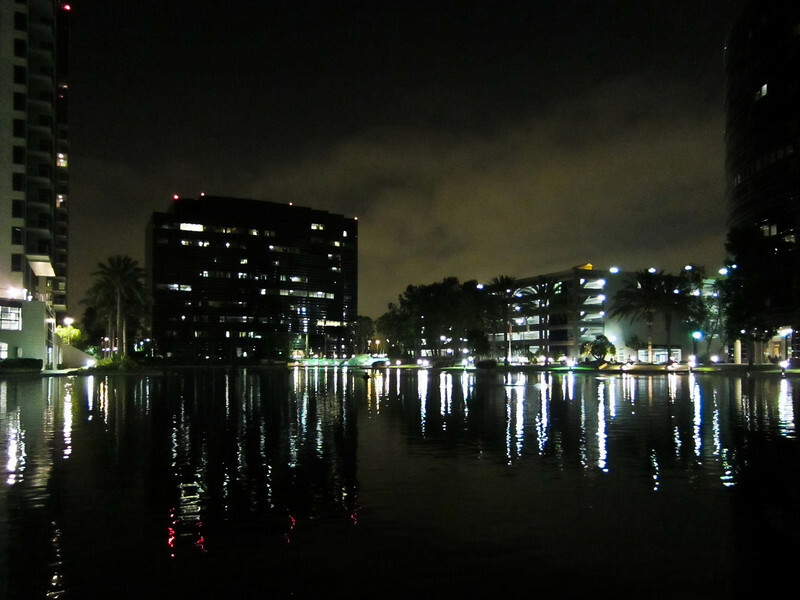 The little ornamental lake in the development, surrounded by the early lights of the buildings and with low clouds behind, catching some of the city light…well…I just had to try. Flash off, camera steadied on a convenient concrete post along the shore, standard Program mode. I took several shots. Though this could have been a black and white shot…I really enjoy the little red highlights in the water! Which just goes to show that beauty is where you find it. It does make me wonder though, if the architects of this office and condo development in urban Southern California saw this in their minds’ eye when they drew in the lake? Personally, I tend to take things like this as intelligent design, rather than random chance. I think the architects foresaw the possibility of beauty in the nightscape and planed accordingly. Which is the way I look at creation itself. If I am wrong…well…no harm done. I get to enjoy the beauty either way. If I am right…well…then there is an aspect of respect…an acknowledgement that a beautiful mind has been at work…and a sense of kinship. After all, the architects only created what they thought others would find beautiful. They counted on my being enough like them to see the beauty they envisioned. Otherwise, why bother? And so it is, I believe, with the creation and the creator. If that adds a dimension to my enjoyment of the beauty, well, I think I am the better for it. Straightened in Lightroom (balancing on top of a round post is not ideal). Corrected for vertical and wide-angle distortion using the new tools in Lightroom 3. Added Contrast and Clarity. Sharpen narrow edges preset. From Zeiss Trip CA 2010.